Plants, just like humans, require oxygen in order to survive. While they release oxygen during the day whenever the process of photosynthesis occurs, they do require oxygen when there is no sunlight. Why not give them the very best with the ENKI Super O2 Watering System? 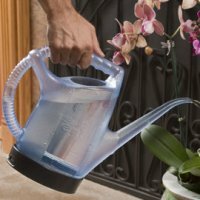 Grow greener, bigger and brighter plants with this unique watering system! The Enki Super O2 water system super-oxygenates water, so your plants produce more flowers and blooms than those watered with regular tap water. Marketing gimmick or the real deal? At $99.95, it had better work or I want my money back. Most Soppiest and Geekiest T-Shirts, Ever!